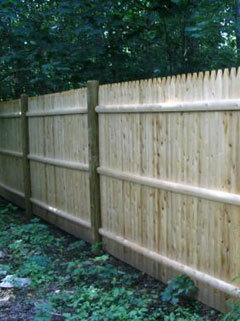 Wood fencing is still preferred by many Massachusetts homeowners who enjoy the look and feel of wood. This is especially true in Boston and surrounding towns where historical home design dictates the need for traditional wood material. In some cases, historical preservation associations actually require that the exact same fence style, type, and wood species be used in preserving and renovating historical landmark buildings. Custom wooden fence designs can be more cost efficient since wood comes at a lower cost than vinyl, aluminum or steel fencing. Carpentry features are also enhanced with the aging of wood as opposed to vinyl material which can remain stark and too pristine. While there is more maintenance for a wooden fence, you’ll also have many more color options when staining or painting to match previous structures. Wooden fence maintenance isn’t always a negative. Many adults can remember their summertime chore of painting the fence, and considered it a “Tom Sawyer” character building moment as well as a family bonding time that they would like to have with their own children as well. 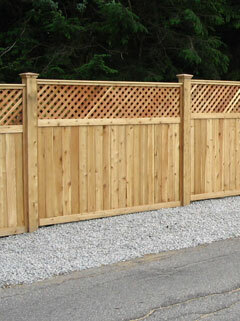 Please browse our wooden fence selections below or contact us with any custom design requests. 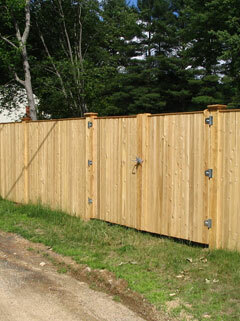 The Cedar Board Privacy Fence with post caps is made with 1″ x 4″ cedar boards and connected to cedar back rails. Each end contains 6′ sections. The Hardwood Split Rail Fence includes 10 foot horizontal rails and 3 foot vertical rails. 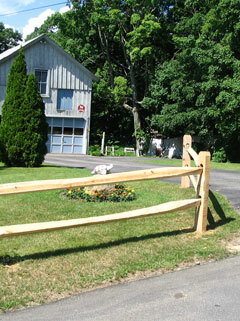 The Cedar Stockade Fence uses round pressure treated posts and white cedar pickets. Each picket is 1″ x 3″ and attached to 2″ x 3″ cedar back rails. Red Cedar Lattice Top features 1″ x 6″ tongue and groove boards and a 50″ solid 18″ Lattice. 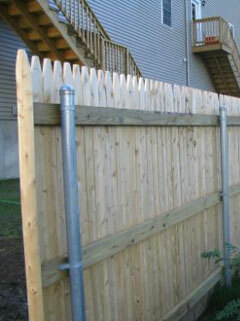 The Cedar Stockade fence uses Galvanized steel posts and white cedar pickets. Each picket is 1″ x 3″ and attached to 2″ x 3″ cedar back rails.